Happy Holidays to everyone! Merry Christmas and a Happy New Year! May all your wishes come true. Leave it to you, Queen Vrinda, to come up with another perfect Hollie-day photo! Thanks for sharing your memorabilia. Happy holidays and warmest wishes to all! THANKS to you Queenie for the fabulously apt photo.It is pure Xmas gold.I absolutely adore it.Doesn't Allan look so angelic?And Tony ,just too cute for words.I wish these guys would land at my door carol singing.I'd soon change those angelic expressions .As Katdowl says,this has made my day too!From the bottom of my heart I send you all my love and best wishes and hope 2008 brings you everything your heart desires xoxox. Susan, Kathryn, and Paula, thanks for all your comments! It did come from an issue of Fabulous Magazine, from December of 1964. I'd love to see these guys caroling in front of my house! I think at Christmas in 1962 or 1963, the guys were singing Christmas carols outside, and one of the tunes they did was "The Holly and the Ivy." That was when they got the idea to call themselves the Hollies. That was one version of how they got their name that I read in a music magazine. It sounds cute! Allan is stunningly angelic here. I love that scarf around his neck. Tony, as you said, Paula, is too cute for words. He's so darn adorable! Graham has a very ethereal touch with the lantern, and Bobby looks like he's having fun. Eric seems to be very causal about it all. Thanks again for all your kind words. Happy Holidays - or rather, Hollie-days! - to you all, and I hope you all get what you're wishing for in 2008! 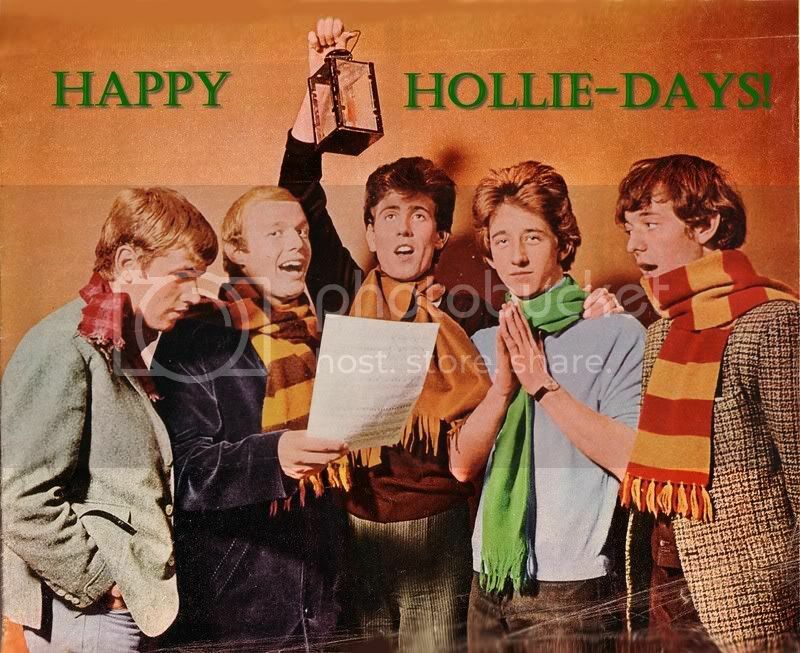 Here you go again, another brilliant photo, love these early photos of the Hollies. Hope you have a wonderful Christmas and a very happy 2008, lets hope you have some more goodies for us in the New Year. Vrinda, Vrinda...you never cease to amaze me..great photo once again. I echo the sentiments of Anthony..you do indeed bring a lot of pleasure to this site. You also have another special quality that hits closer to home...you're a New Jersey Girl! Have a very Merry Christmas and Happy New Year. Thanks for a lovely photo, Vrinda!! Thankyou for another brilliant photo. The guys all look great and look like they really enjoyed each others company. Tony is so cute and looks like he is about to pray. Thanks for all your good wishes, folks! I love what I do here! Hope you all had a Merry Christmas and all the best in 2008! P.S. Thanks, Alan! I wouldn't want to be from anywhere else!